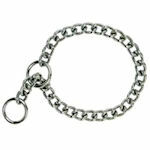 The finest quality, Herm Sprenger throw chains, made in Germany. The end rings are unwelded, providing a ringing sound. Various training methods recommend specific uses. Used to get the dog's attention or redirect the dog's current behavior. Makes high pitched ring sound when thrown to the ground. 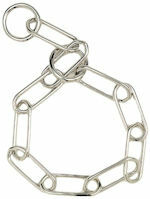 The high pitch ring is caused by the non welded chain-links. Lightweight and compact for easy carrying.